There are many reasons that you may not want a diamond or seek an alternative to a newly mined diamond. Colorless alternatives to diamonds include white sapphire and cubic zirconia. Alternatives to newly mined diamonds include recycled/reclaimed and synthetic diamonds. Though the name sapphire is derived from the Latin word meaning “blue”, natural sapphires can also be found in yellow, brown, pink, purple, red, orange, greenish, or colorless forms. Trace minerals give colored sapphires their distinctive colors, but are absent from the crystalline structure of white sapphires. White sapphires are an excellent alternative to diamonds, particularly for engagement settings. 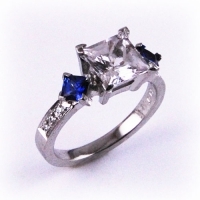 Sapphires rank 9 on the Mohs scale, second only to diamonds in terms of hardness. This makes them a durable option. With a refractive index in the 1.77 range, and a dispersion of 0.018, white sapphires do not have the same brilliance of a diamond (refractive index of 2.4, dispersion of 0.04). The principle difference in the appearance of the two materials is that white sapphires reflect white light in the faceting, whereas diamonds reflect the full color spectrum in the faceting. Though sapphires lack some of the distinctive “fire” and dispersion of a diamond, they do present a viable alternative to diamond, at a significantly lower price point. Cubic zirconia is a synthesized material that is frequently used as a substitute for diamond. Hard and optically flawless, cubic zirconia is the cubic crystalline form of zirconium dioxide. Unlike white sapphire, cubic zirconia has a refractive index and dispersion rivaling diamond (RI=2.15-2.18 vs. 2.4, D=0.06 vs. 0.04), making it nearly indistinguishable from diamond at a fraction of the price. Rating an 8 on Mohs hardness scale, cubic zirconia is not as durable as diamond (hardness of 10) and it is susceptible to chips and scratches. A CanadaMark diamond is a diamond that is responsibly mined in Canada’s Northwest territories. They are natural and untreated. The diamonds are tracked through audited processes at every stage from country of origin to polished stone. 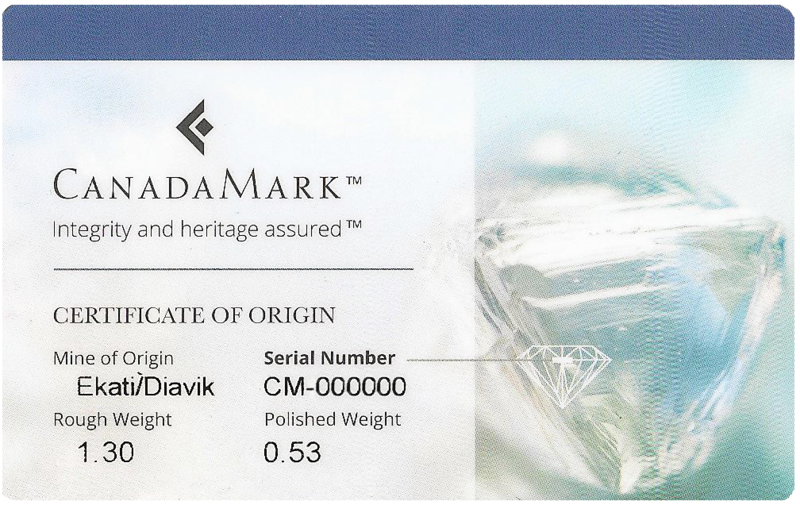 When you purchase a CanadaMark diamond, you will receive a card verifying it’s authenticity. The card is a certificate of origin explaining the mine of origin, serial number, rough weight of diamond and the polished weight of the diamond. You will find more information about these diamonds on the CanadaMark website. Approximately 4.5 billion carats of diamonds have been extracted since large-scale mining began in South Africa in the 1870s. With so much existing stock, the reuse of diamonds presents a good option for those seeking to mitigate the industry reliance on newly mined stones. A reclaimed diamond is one that has been previously used in a piece of jewelry, removed, cleaned, possibly re-cut, and then mounted into a new piece of jewelry. A reclaimed diamond is every bit as precious as a freshly mined diamond. However, the social and environmental “bill” has already been paid. Gem-quality diamonds can be produced through artificial processes. The product is chemically, physically, and optically identical to naturally occurring diamond crystals. Laboratory-created diamonds can be distinguished from naturally occurring stones using spectroscopy to detect trace impurities of nitrogen, nickel or other metals in their composition. Reputable manufacturers of laboratory-created diamonds are committed to the disclosure of the origins of their diamonds. Laboratory-created diamond gemstones are available in sizes up to 1.5 carats and in colors yellow, blue, and colorless (or white). The yellow color comes from nitrogen impurities in the manufacturing process, while the blue color comes from boron. Other colors, including pink and green, are achieved by using irradiation following synthesis. Created using a modest amount of electricity and resources, laboratory-created diamonds present an eco-friendly alternative to mined diamonds. With the physical and chemical properties of a natural diamond, your laboratory-created diamond has the longevity of a natural diamond without the environmental and social impacts of newly-mined diamonds.